Standard Lines – Jazz and Bebop standards Book III in the Constructing Walking Jazz Bass Lines series for the Electric Bassist. Jazz Bass tab Edition . A comprehensive guide demonstrating the devices used to construct walking jazz bass lines in the jazz standard tradition. 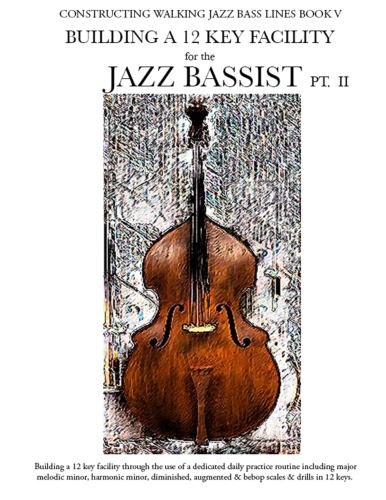 Book III covers 24 jazz standard chord progressions with 110 choruses of professional jazz bass lines as an example. Part I. Outlines the Modes and the chord scale relationships and the fundamental knowledge required to be able to build the diatonic triads and 7th chords in any key. Examples are given in the ” 2 ” feel and ” 4 ” feel walking bass style enabling the bassist to develop a strong rhythmic and harmonic foundation. More advanced bass line construction examples including voice leading and mode substitutions and mode applications related to specific jazz chord progressions are also outlined. Part II. Outlines the Symmetric Scales as well as the Modes of the Melodic Minor Scale related to the Minor II V I progression. Provided are written examples of the Symmetric Scales and the chord scale relationships and how to apply the use of the Symmetric Scales over popular jazz chord progressions. The Minor II V I is outlined and compared to the Major II V I outlining the differences with the suggested scale uses applied to common jazz chord progressions. Part III . Outlines the use of the BeBop Scales and their use in the jazz walking bass tradition, providing suggested uses of the BeBop scales related to popular jazz chord progressions. Part IV . Outlines the previous lesson devices and concepts with examples of professional level bass lines over standard jazz chord progressions. All information builds in a stepwise progression enabling the bassist to apply the techniques in all 12 keys.